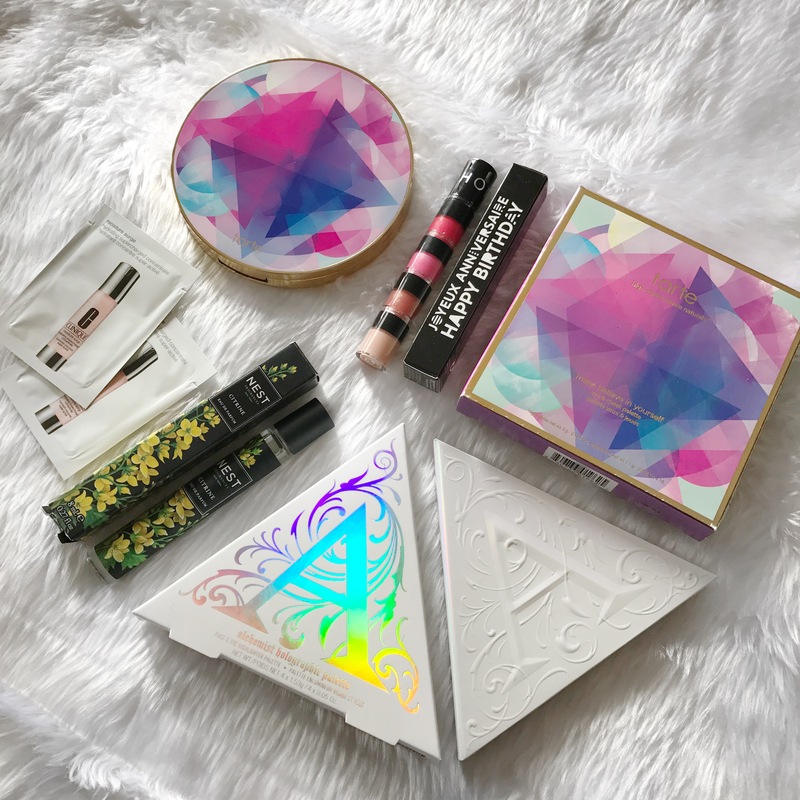 I’m a little late with this post, I didn’t have a whole lot of time in the break to do much as far as ‘creative’ makeup goes so I wasn’t able to get this up on time but I have it here now and I hope that you enjoy! So the theme of this challenge was Mermaids and Mermen and I did think about possibly doing a merman makeup look but then I had some other ideas and yeah. I actually was set on doing something completely different to what I ended up with! 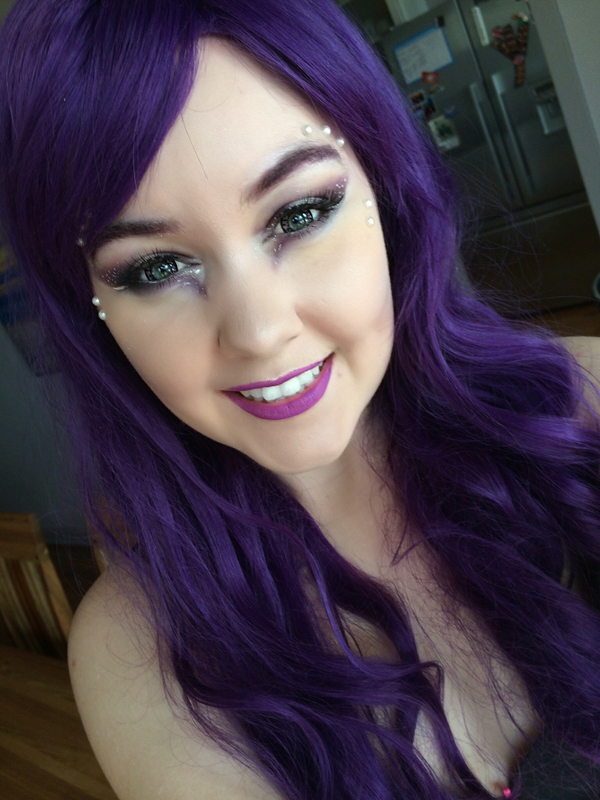 Today, I will be sharing with you my Futuristic – Galaxy Mermaid. 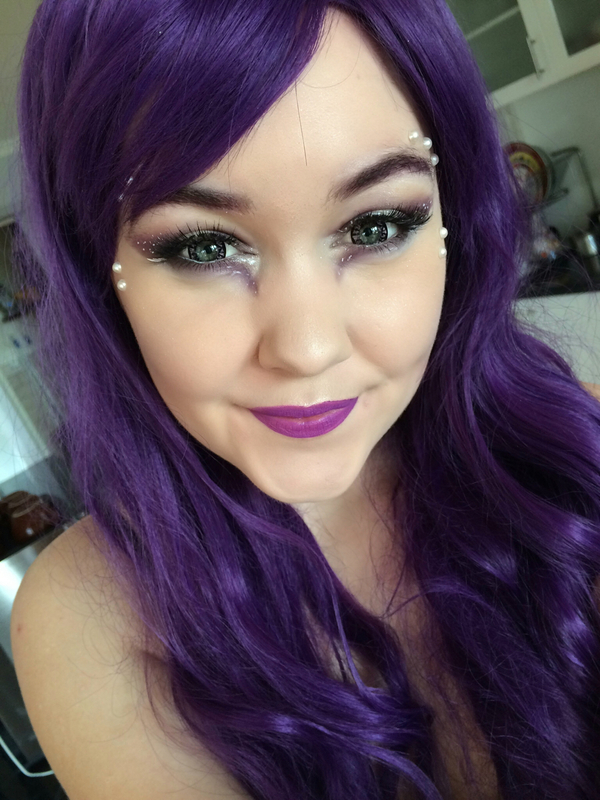 When I originally thought about it, I wanted to do a galaxy pattern on my forehead or around my eyes like a bit of a mask and incorporate bubble stars around my head but then I kinda felt like it had been done before so I thought, what about a mermaid from the future, a world where technology has really taken over and I thought it would be cool to do something natural in an unnatural setting. Well as natural as a mermaid can be, anyway. I don’t know if this is a totally original idea, I’m sure someone has thought about it before. 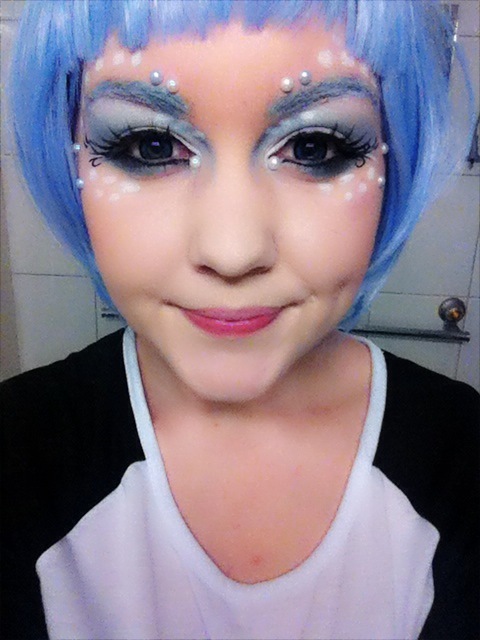 I was heavily inspired by the Monster High doll Elle Eedee. She’s a robot and she’s going to be in the new Boo York Boo York movie and she’s definitely my favourite of the new dolls. I was even considering drawing on her little power button that sits between her eyebrows but I didn’t want to make a robot mermaid look so I stayed away from that. So for the eyes, I went a little bit out of my comfort zone but still not very far. Honestly, I’d really like to do something really really wild but I get so nervous that I’ll just destroy what I’ve created so I don’t stray too far out of what I know that I’m capable of. 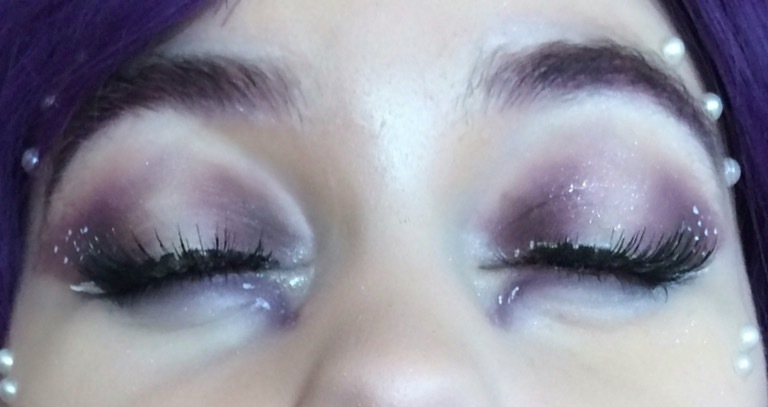 I did a sort of halo eye look. I’m still not too certain about what qualifies as a halo eye but you’ll know when you see it. 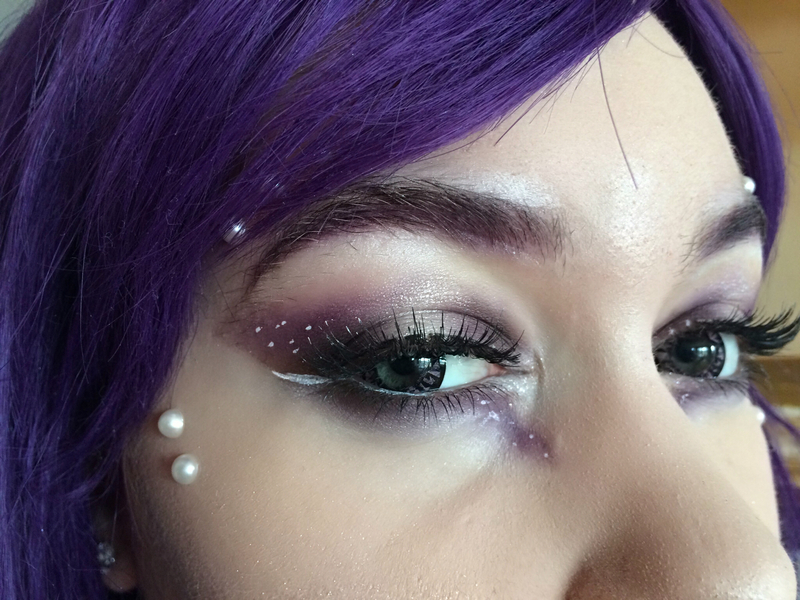 I just kept building shadows on top of each other, starting with the Too Faced Chocolate Bar Palette, a few Inglot eyeshadows and Ice Queen from Makeup Geek. 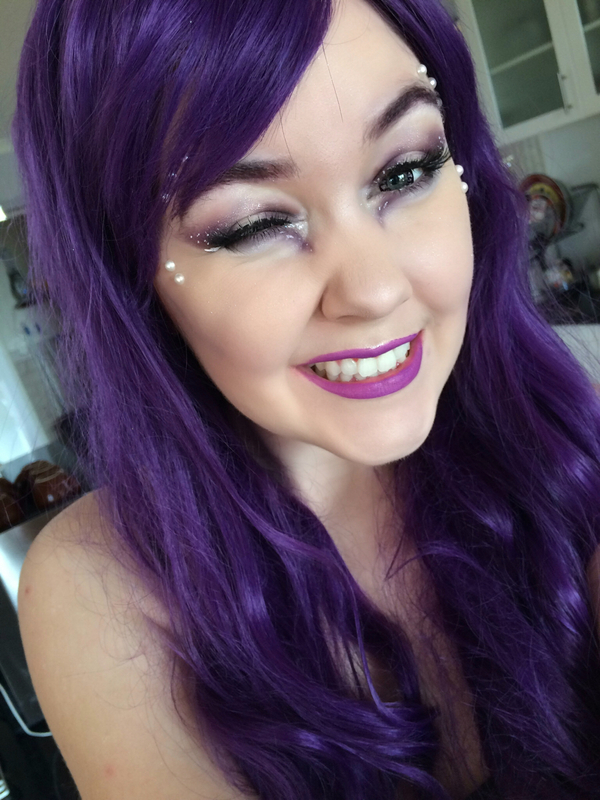 I still added dots that are meant to represent stars in my dark purple eyeshadow. I wanted a little galaxy flavour haha. 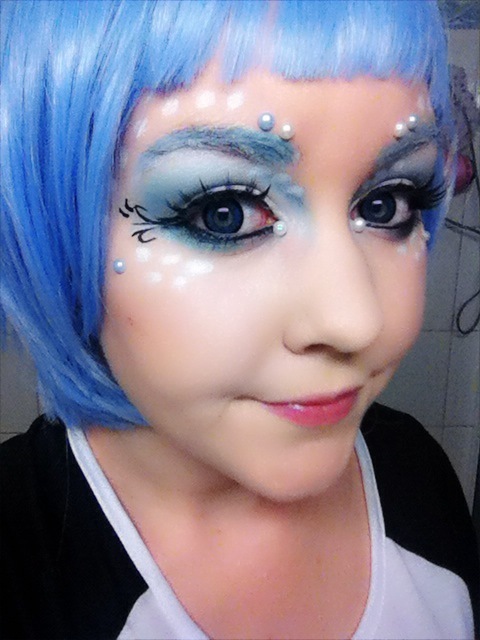 And a line of white liner that runs from my water line out to a wing for the ‘Milky Way’ haha. 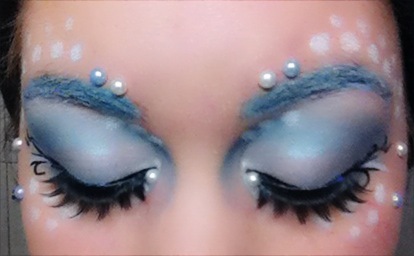 In the centre of my lid I used NYX roll on shimmer in Platinum to make my eyelids pop and sparkle. 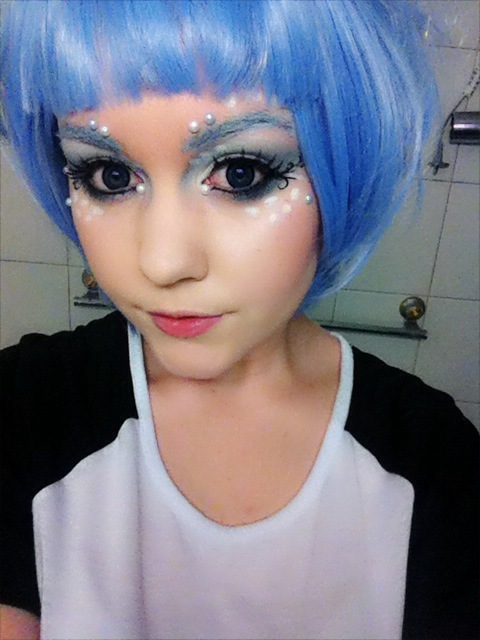 I also used it on my inner corner, there was so much glitter going on. In the future, glitter will always be on trend. 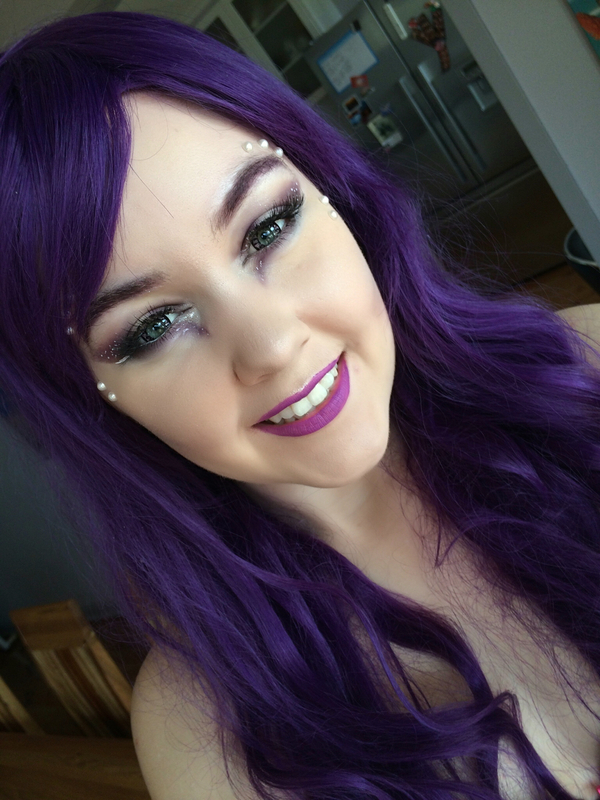 It doesn’t show up much in the photos but I do have some purple side burns because I tried to contour with purple and it basically looked like a line of zinc had been drawn on my face and I couldn’t blend it out for the life of me but it didn’t really hinder any photos so I suppose it wasn’t a total failure. I think that in this world, humans know about the mermaids because it’s hard to hide anything with people recording everything that they see and documenting life with such ease. With the world forever changing and creatures forever adapting, merfolk can now switch between their fishy tail and a nice set of legs so that they can live in either environment. You wouldn’t be able to tell who’s a merperson either because everyone has gone all Capitol and everyone wears crazy makeup and dresses up because everyone is creative and likes to express themselves. I hope that you enjoyed this post and hopefully with the next challenge, I can really push myself to be as creative as possible. I hope that you have a fantastic day! 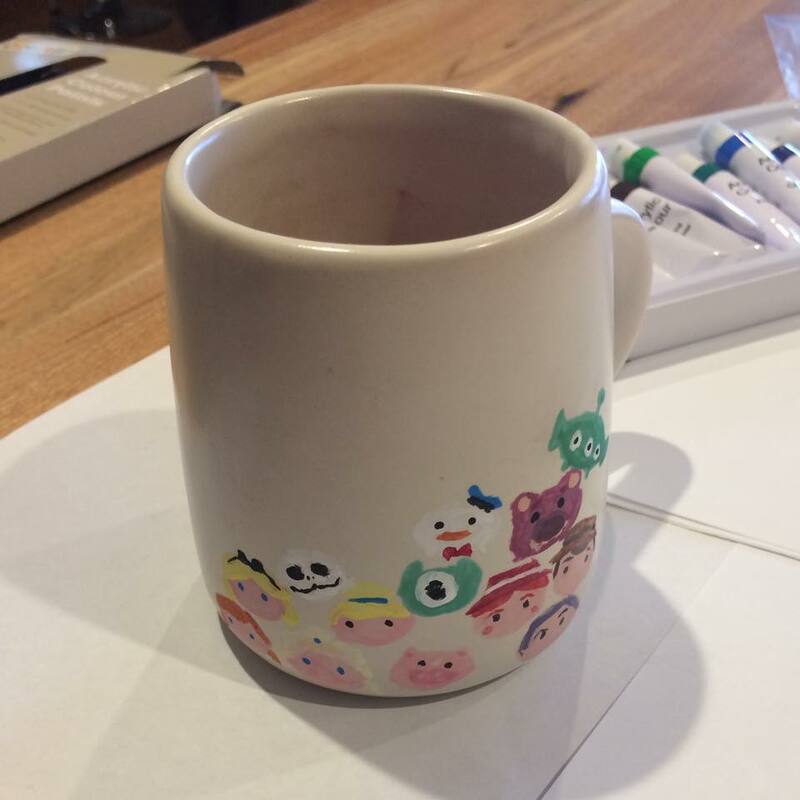 Disney Week: Toy Story Tsum Tsum Mug! Today is the anniversary of Toy Story 3 and I was really thinking about what I wanted to do for this look to keep this challenge interesting. So far, you’ve seen two makeup looks and one Disneybound so I thought that I might do something that isn’t makeup related but it is art related. I was talking to Procrasticaitlan about ideas for today and she was talking about painting mugs and I thought that that would be a great idea for Toy Story! 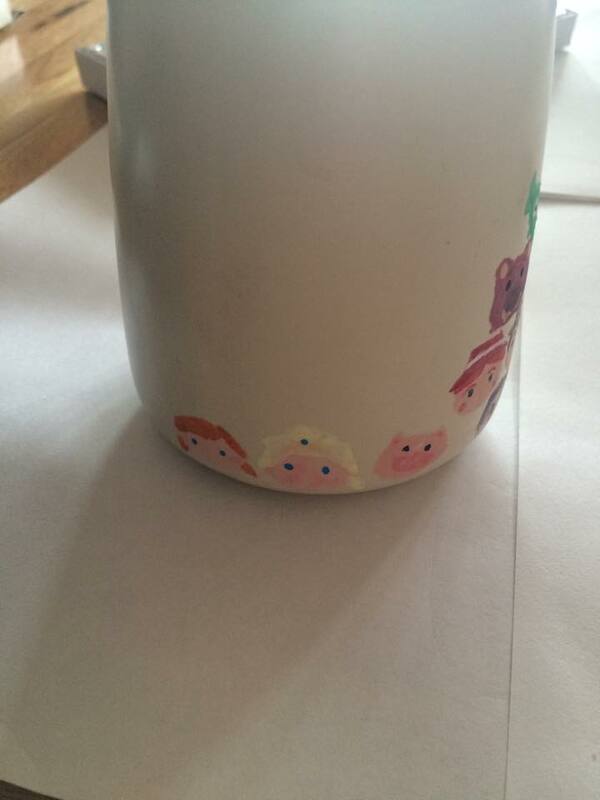 Here are progress pictures of my Disney Tsum Tsum mug! At this point in my mug painting progress, I was pretty proud of myself. I haven’t painted in 3 years and when I did it was on a canvas, not a little mug. But I figured that I paint on my nails all the time so this shouldn’t be too hard. I thought that Jessie, Woody and Buzz all looked like their little Tsums in the game so I was very happy to post a progress shot to instagram. I had to relocate and I feel like this was were I had my biggest let down in mug progress. I had to use a new blow dryer to dry the paint so that I could finish this quicker and it sprayed black dust on to freshly painted base shapes for Lotso and the Alien. To fix the Alien, I had to make him bigger and then he got too big. Later on I added Ham and he looked pretty cute. He’s right down the bottom, you’ll be able to see him better in the next picture. After finishing the Toy Story Tsums, I thought I should fill the cup more and I guess this was another bad idea on my part? Here is Anna and Elsa next to Ham. I hope that you enjoyed seeing my Tsum Tsum mug for Toy Story 3 day! 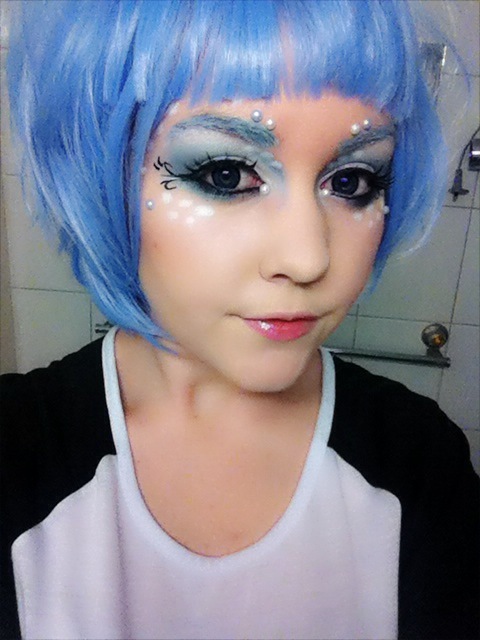 Ever since I saw Mashyumaro post a look on her instagram using ice blues and her signature twirling eyeliner, I wanted to recreate it. I really wanted to push myself a bit and do something a bit different to the basic looks I’m used to creating. 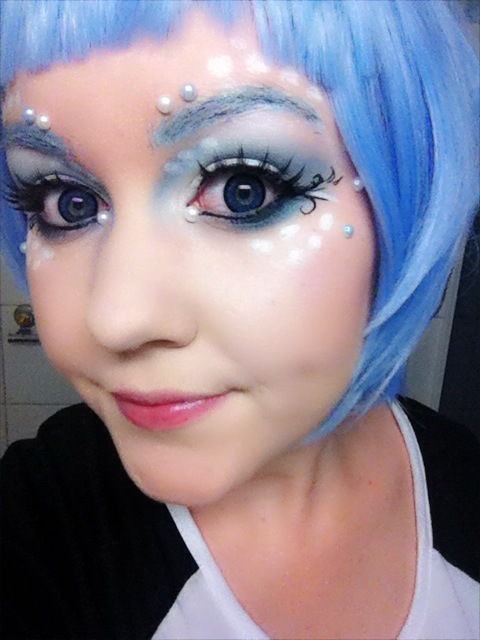 I was also pushed to do this look after watching the Tinkerbell Secret of the Wings movie. I fell in love with Periwinkle and I had her in mind when I was doing this! It is pretty intense and I just love it. I bought the little bubble stickers today from the cheap store (they weren’t that cheap though 😡 ). I’ve never coloured my eyebrows before, even when I wear my wigs I just fill my eyebrows in the same way as I would on a regular day. So, if they look really messy, you know why. 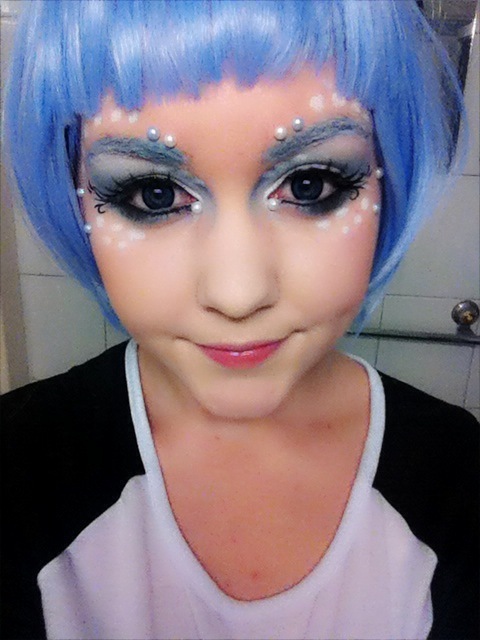 I basically used NYX Jumbo Pencil in Milk everywhere over my eye area. All over my lids as a base and then in my brows and then on top of my foundation for the dots. 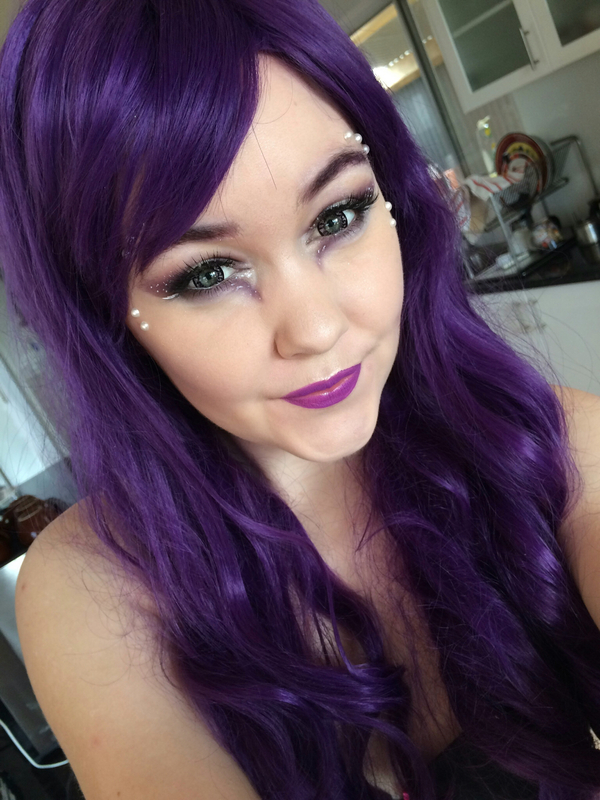 I wanted to show this photo of my pre-wig face because once I put the wig on, you couldn’t see the top dots around my eyebrows. Hope you’re having a magical day!